Is Tour de France peloton safer with smaller teams? Riders are skeptical that a smaller peloton, prompted by a UCI rule change, is any safer for the Tour de France. 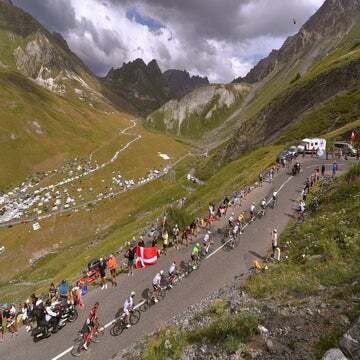 QUIMPER, France (VN) — This Tour de France counts fewer cyclists with smaller eight-man teams, but some riders say it makes no difference for group safety with crashes already rocking the race’s first week. In September 2017, the UCI reduced the allowed team rosters from nine to eight in grand tours and eight to seven in smaller stage races and classics. Landa fell in stage 4 with Jakob Fuglsang (Astana), Daniel Martin (UAE-Team Emirates), and Bauke Mollema (Trek-Segafredo). This was part of a wave of crashes in the first week, the others involving Chris Froome (Sky), Richie Porte (BMC Racing), Adam Yates (Mitchelton-Scott), and Fernando Gaviria (Quick-Step Floors). “It doesn’t change anything,” said Sonny Colbrelli (Bahrain-Merida), second in stage 2 and stage 5. The Tour began with 176 riders instead of 198 like in past years — each of the 22 teams slashed by one. The size reduction should help the group snake down the French departmental and national roads. It should. “Even less riders, every day, there are still crashes,” Colbrelli continued. “Having 20 more or 20 less cyclists is not going to change anything. The problem is there is so much stress, the roads are not large, and all you need is a bump and 15 riders fall. The stress of the race’s first week adds up as sprint teams lead-out in the final kilometers for their men and mix with GC teams trying to put their leaders as far up as possible to avoid splits in the group. The recipe often spells disaster. In recent years, motorbikes took out cyclists. Greg Van Avermaet fell due to one in the 2015 Clásica San Sebastián and Jakob Fuglsang in the 2015 Tour de France. In a tight Tour of Flanders passing, a neutral car clipped Jesse Sergent. “Even if you reduced the teams to seven men in the Tour de France, you’d still have a problem,” Landa added. “It’s the Tour, we’re feeling the speed, the average is pretty high. Maybe if we put a limit on the chainrings. That way you’d never go over 70 [kph]. Now, some are putting on 55- or 54-tooth front ring. I’ve never used one before. In the first days, I had a 54 just to stay on,” the Spaniard added. Some in the group say the change is being felt. Already in the Giro d’Italia, riders noted fewer incidents whether or not it was related to group size. “So far, maybe you don’t see a change in the Tour,” said Tom Dumoulin (Sunweb). “But in the Giro, we didn’t have one crash, but I don’t know if you want to take conclusion from that. We had a smaller peloton there and I like that the peloton is smaller. “It’s a question you can’t answer on the fifth day of the race,” BMC Racing boss Jim Ochowicz said. Ochowicz also suggested that bringing in lower-level teams does not help. 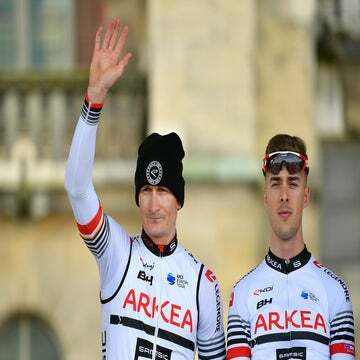 In the Tour and other races, the organizer must invite the 18 WorldTour teams and can add in a few Professional Continental teams from the next division down. The Tour counts four of them.